A dozen yoga poses, performed daily, may increase bone density. Like most of us, you may have become accustomed to thinking that only common weight-bearing exercises—walking, running, jumping, and lifting—provide enough stress on your bones to maintain or increase their density. So a scientific paper titled "Twelve-Minute Daily Yoga Routine Reverses Osteoporotic Bone Loss" came as a surprise. And it appeared to offer women another option to build bone. The researchers who designed the study noted that yoga's established benefits—including better balance and coordination—protect against falling, a major cause of osteoporotic fractures. They wanted to determine whether the yoga poses they selected might also increase bone density by imposing force on the spine and hips. They recruited 741 people who joined the study on the Internet between 2005 and 2015. The participants were asked to submit dual energy x-ray absorptiometry (DEXA) scans of their hips and spines, and other lab tests, at the beginning of the study. They also received DVDs with instructions for the yoga poses and were asked to log their yoga activity online. The logs indicated that 227 participants, 202 of whom were women, practiced the routine at least every other day for two years. Their average age was 68 when they entered the study, and 83% had lower-than-normal bone density. The DEXA scans they submitted at the end of the study showed significant increases in bone density in the spine. Hip bone density increased, too, but not significantly. None of the participants reported bone fractures or other injuries caused by doing yoga. 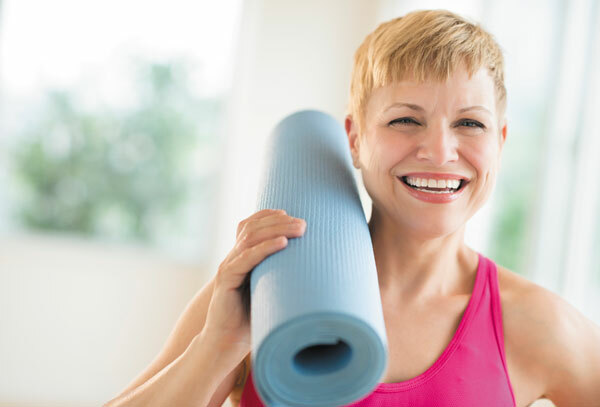 Though promising, the study, published in 2015 in Topics in Geriatric Rehabilitation, doesn't provide conclusive evidence that yoga can reverse bone loss. The researchers acknowledged its drawbacks: less than one-third of the study's participants adhered to the yoga routine by practicing the poses at least every other day throughout the study, and just 43 submitted complete actual DEXA reports at the beginning and end of the study. "It gives one a reason to be cautiously optimistic, but a more complete study should be done," says Dr. Marian Hannan, professor of medicine at Harvard Medical School, whose research includes the effects of biomechanics on physical function. Dr. Hannan notes the participants were also self-selected, not randomly enrolled. In other words, they wanted to practice yoga. "Would the results be equally promising in people who were simply assigned to do yoga?" she asks. Yoga is a mind-body activity, and to get the most benefit requires full engagement. Want to try this yoga routine? The poses practiced in the study are illustrated below. 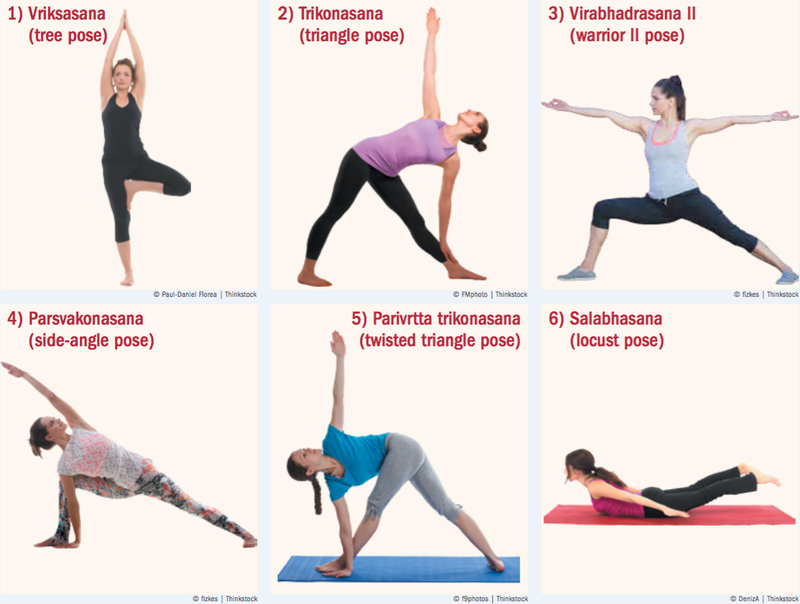 Each pose should be held for 30 seconds and followed by a 30-second pause. If you already practice yoga, you may be familiar with these poses. If you haven't done yoga before, but think it's worth giving the routine a try, you should take lessons from a professional yoga instructor to learn be-ginners' versions of the poses and ensure you are doing them properly to avoid injury. Study participants were advised to seek an instructor of Iyengar yoga, which emphasizes body alignment and breath control. The DVD used in the study, which also demonstrates adaptations of the poses that are easier for beginners, is available for $25 from sciatica.org, a website maintained by Dr. Loren Fishman, the lead investigator of the study.